Youth and Teens are met in age-appropriate group settings or individually. Yoga addresses mental calm, focus, relaxation, strength and flexibility. Corrective Movement class, "Long & Strong" addresses muscular balance between strength and flexibility from a brain-based movement perspective. Ages 7 and up enjoy a themed mix of crafts, conversations, activities, and movement while they explore important relationships - particularly with themselves. 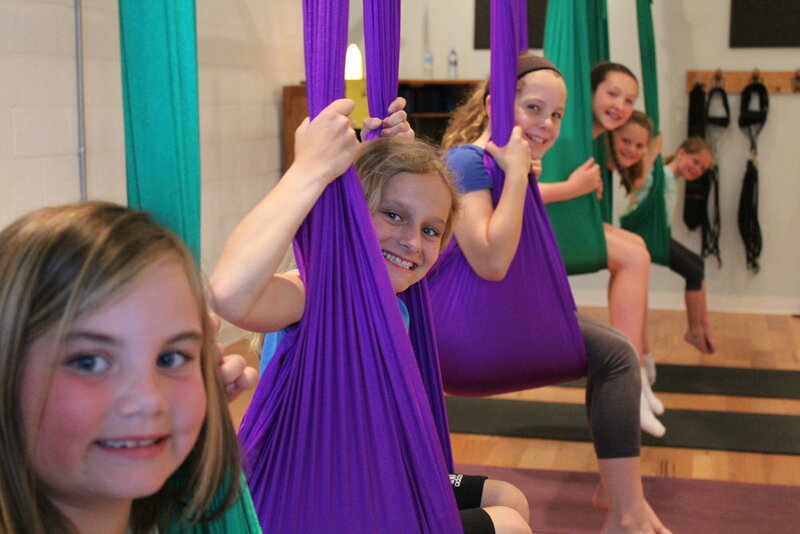 During each of our three mini-yoga camps this summer, students will explore movement in the form of yoga asana and aerial hoop asana, stress management techniques, and discuss the 'yoga' of nutrition. Three mini camps are each three hours in length from 3:00-6:00 p.m.
Fee is $40 per session per child, or $105 for all three. Families enrolling more than one child, please call us for discounted rate on the second child. Ages 13 and up join senior yoga and pilates teacher Stacie Hastrawser for this summer 6-week series combing work on our pilates/suspension apparatus with yoga to achieve strength and flexibility in both mind and body. Ideal for off season training for athletes, or any teen simply looking for a way to feel better and move better in their bodies. 6 Week Series runs from June 12-July 10th. Make ups for missed classes are allowed for any of the classes on our main schedule through Sept 30, 2018. Time: 4:30 - 5:25 pm Tuesdays June 12-July 10. Did someone say aerial? At long last - it's back! First session is Friday June 18th at 4:00 for ages 7-11 and 5:15 for 12 and up. Fee is $25, and spaces are limited to 5 in each class.